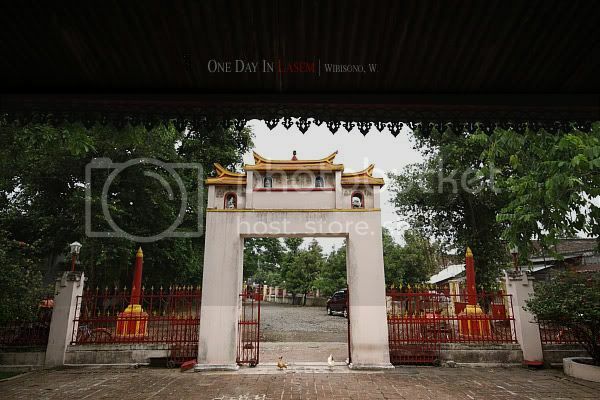 When coming to Lasem for the first time in 2010, I was not only impressed by its heritage from the past as "Little China in Java," but also eager to return and explore it more. So I kept dreaming of coming back until my friend, Eli, somewhere in November last year text me a message, asking whether I was going to travel in January. I didn't notice then that there was gonna be a long weekend, celebrating Chinese new year in January. She had an idea of traveling to Lasem. Well, I thought Lasem was just a small town that didn't really celebrate the new year in a festive way. 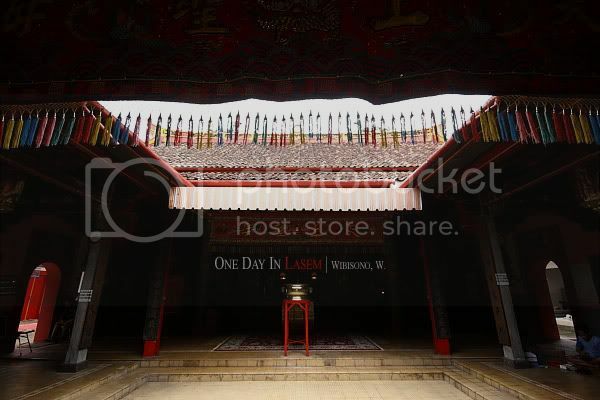 So I sugest that we went to Semarang, and put Lasem in a one-day-trip plan. 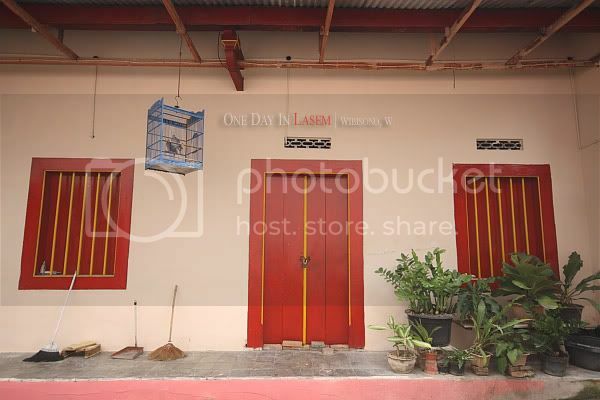 After several changes in plan, we decided to visit Lasem on 21 January, the first day of our three-day-trip. There were three of us plus one driver, riding a rented car from Semarang. 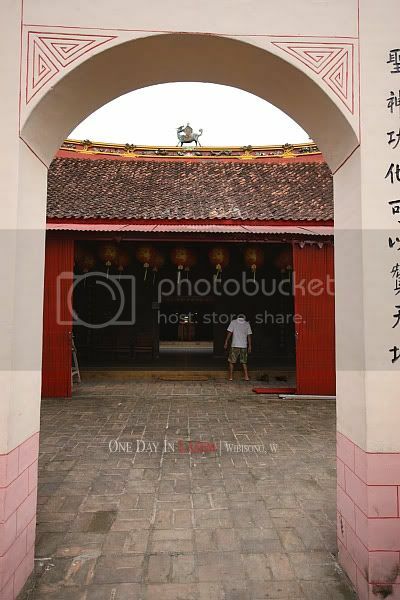 First thing we did in Lasem was having breakfast at the Grand Mosque, then headed to Dusun Tulis where there was an old Chinese cemetery that I had seen earlier on my first trip to Lasem. The graves, or Bong as the locals called them, were adorned with engravings, picturing something like legend stories or myth from China. Sadly, nearly all the figures in the engravings were accidentally headless. 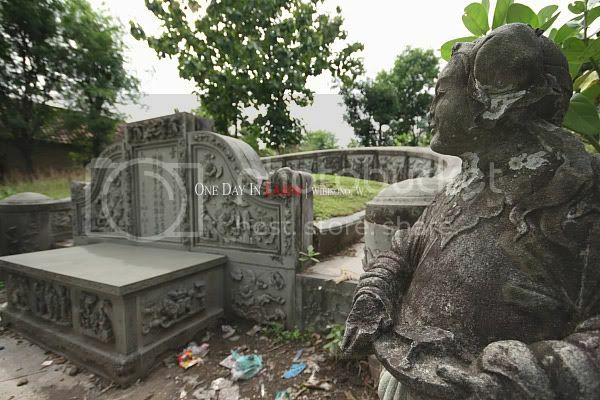 There, we met Pak Mugiyono, a local resident who told us that the cemetery belonged to noble Chinese people. In other words, only those with high position in society could be buried there. We couldn't find out who they were as all the tombs were marked with Chinese letters. Next, we headed to Desa Jeruk, Kecamatan Pancur. Thanks to Pak Dipo - a man I met two years ago and was concerned with Chinese culture and history - who informed me about this traditional village, located outside Lasem. 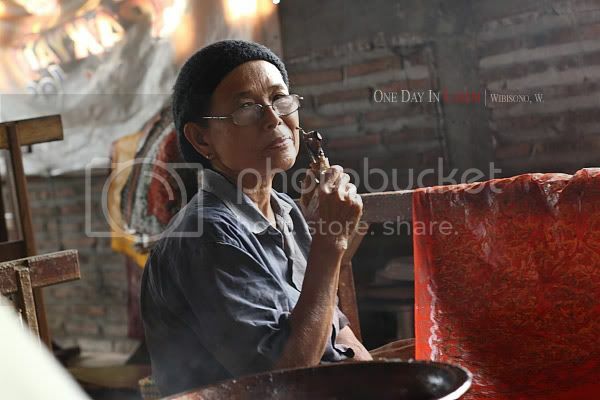 The village was once aired on Metro TV as there were two men (Pak Santoso and Pak Willy) trying to empower local women there through "Batik Lasem," a centuries old traditional handy craft, brought directly by early Chinese migrants. It wasn't easy to find the village as we all had no clue. We had to ask local people for directions. After several losts, we finally found the village. 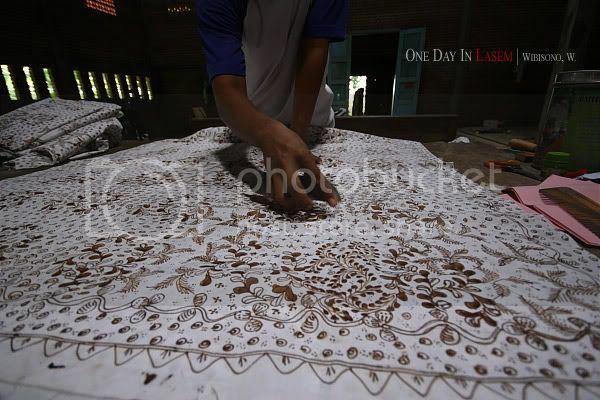 First, we met Ibu Rumiah who was busy working on a sheet of white fabric of batik in front of her house. We thought she worked at the porch but later found that the place was actually a barn for her cattles. 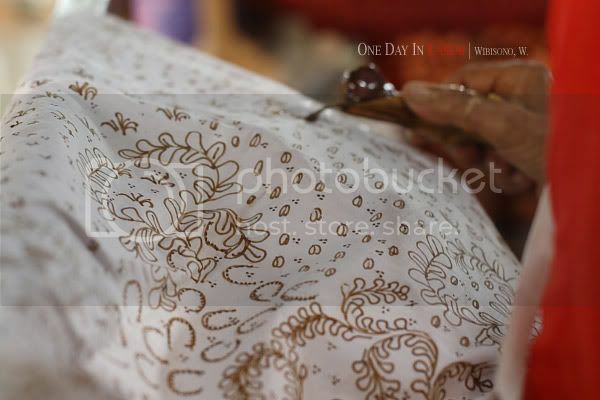 What she did was blocking certain part of the pattern - which had already been drawn by someone else - on the fabric with a melted brown wax, so as not to be colored in the next stage of coloring process. Ibu Rumiah learnt the process of making batik from her mother when she was nine years old. 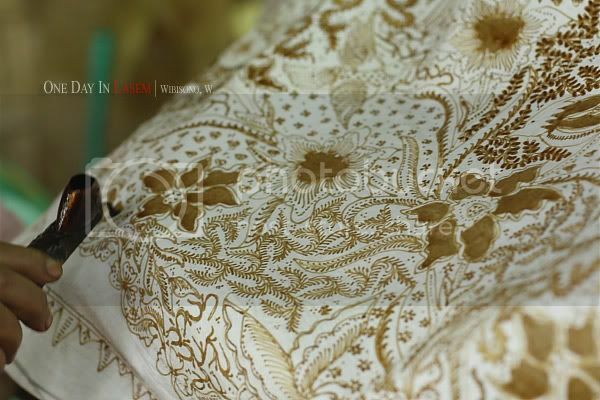 From each sheet of the fabric she worked on, Ibu Rumiah earned seven thousand rupiahs. 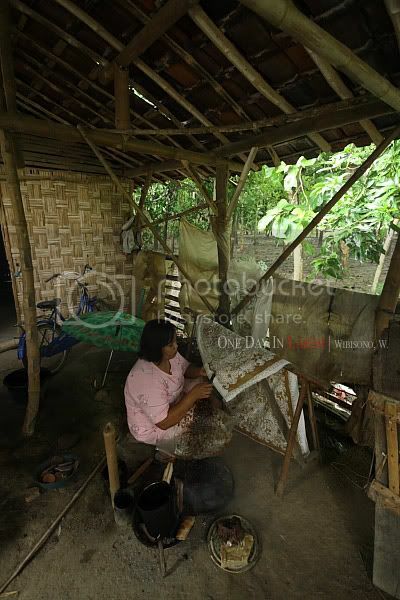 Next, we moved to "Sanggar Srikandi," a small scaled batik workshop just a few meters away from Ibu Rumiah's house. The place was founded by William, known as Pak Willy. Too bad, there was no activity there as it was being renovated. From an old man living in front of the place, we obtained information that on every Sunday, there was a training of making batik for children. Well, I guessed this would be a good reason for us to return one day. The other workshop to visit was the one founded by Pak Santoso. 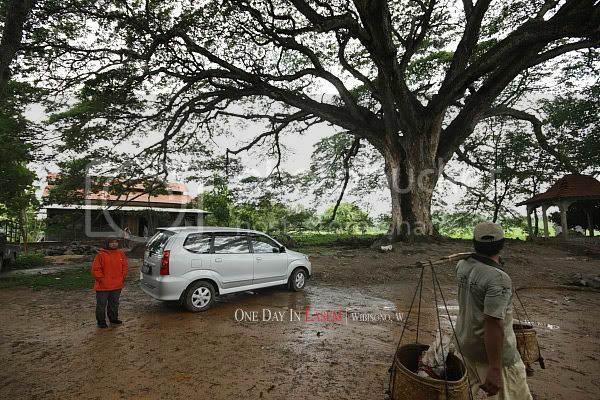 I saw the place for the first time on TV and was very impressed by a huge tall old tree shading the place. I enjoyed spending few minutes, standing under the tree, watching the vast rice fields in front of it and also listening to the sounds of frogs. But I wasn't sure at night, because there was a sacred old grave under the tree. The tombs were covered with white cloths. No one in that place knew who were buried under there. The workshop was being renovated, but fortunately there was still activity inside. There was only one guy working in the workshop. He was in charge of receiving guest and scraping wax from fabrics. 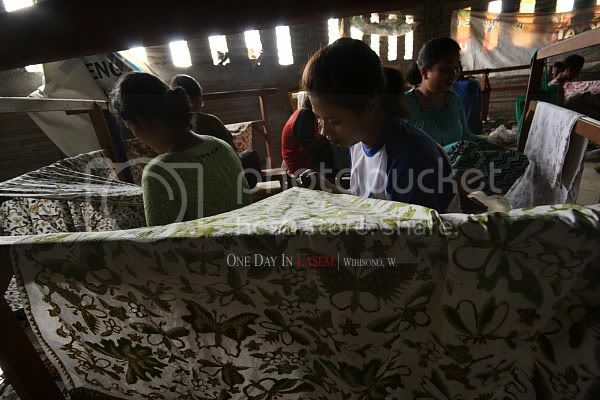 All the labors were women from local village, working in groups of five. Each group has its own task. They worked from eight to four everyday. It was fun to interact with them. We joked around about daily stuffs. And as a reward, they allowed us to take their pictures. At one corner, I saw a woman brought her kid to the workshop. Having seen by myself the process of making batik, I realized that this was absolutely an intricate work, requiring patience and persistence. Hats off to those women! 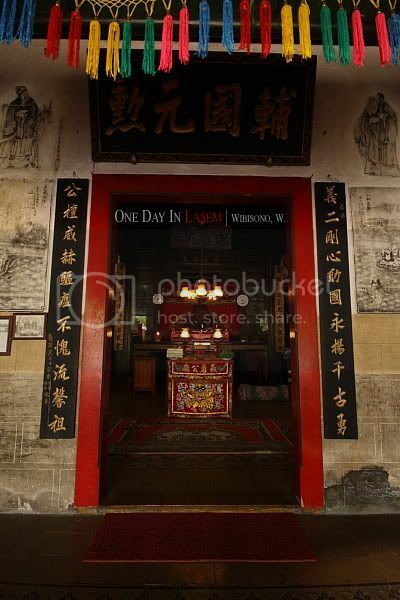 The history of Lasem was strongly related to early Chinese migrants to Java. In 17th century, there was a man sailing from Fujian Province, South China. His coming to Java was for trying his fortune in the new land. 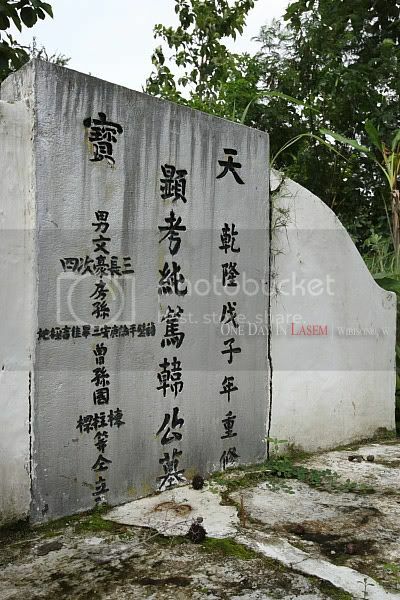 He landed in Lasem and became the first "Han" (a Chinese clan) in Java. His name was Han Siong Kong. He married a local woman who gave birth to some children (no one knows exactly the number) who would become the early generation of Chinese Peranakan in Java. 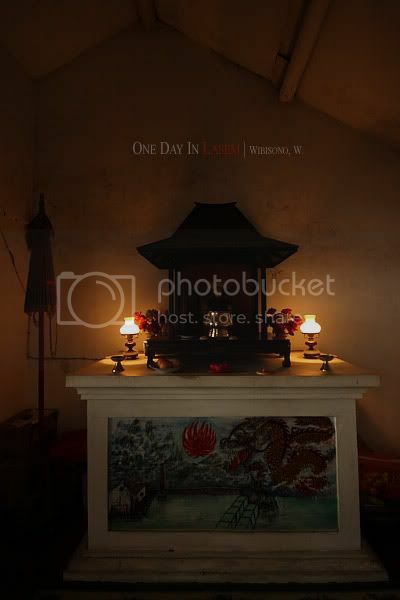 His trying to make a fortune in Lasem was not successful until he died in 1743. The money he left was not enough for holding his funeral. In old Chinese tradition, a funeral could indicate someone's hierarchy in society and required lots of money to hold it properly. The children, felt obliged to hold a proper funeral, tried to multiple the little money their father left in a gambling house, and ended up with losing it all. No money meant no proper funeral. So they put the dead body in a sack and brought it to a remote place at night. While they were passing a rice field, a heavy rain suddenly poured down and pushed them to find a shelter. Instead of taking along the dead body in the sack to the shelter, they put it in the middle of the rice field and left it alone under the rain. They stayed in a hut while waiting for the rain to stop and fell asleep. In their dreams, Han Siong Kong came with anger and cursed them for leaving his dead body alone. He said that no one of his descendant was allowed to live in Lasem. Any ignorance to his curse was believed to mean a bad luck. The children suddenly woke up as there was a huge thunder stroke the hut. They ran toward the dead body in the sack and found it gone. On the place they put the sack, a tomb (Chinese: Bong) had magically erected in the middle of the rice field. Since then, Lasem had until now become a forbidden town for the clan of Han. 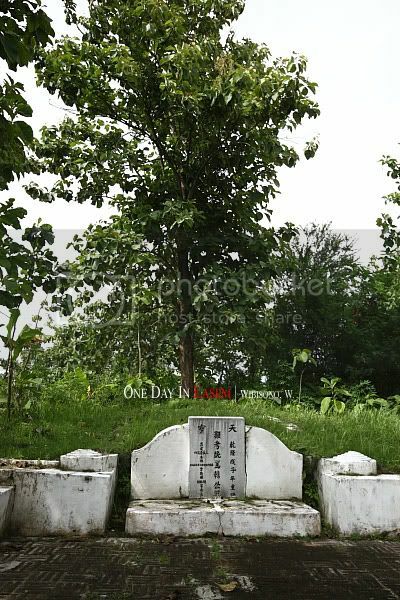 As we returned to the town, I text Pak Dipo again, asking whether he ever visited the tomb of Han Siong Kong. He replied: yes. He told me that the local people recognised him as Han Wi Sing. It was located in Babagan. Our searching for the tomb stone had brought me to a grocery store, run by a local Chinese family who thought that I was the descendant of Han Siong. They were so kind as to let us get assisted by their shop keeper who would go with us in the car and show the direction to the tomb. 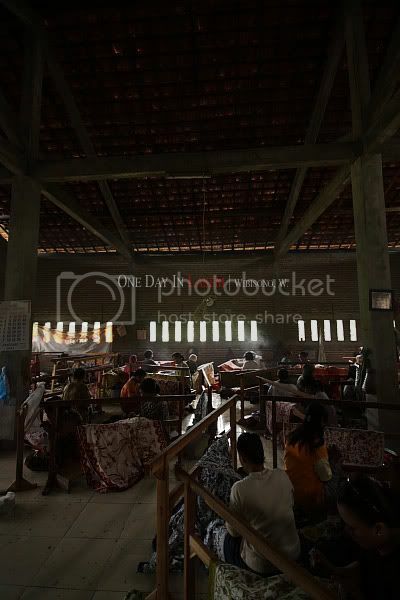 It was Mbak Nur, a Sundanese woman who had been for years lived in Lasem with her Javanese husband. She wasn't sure where the exact location of the tomb was. She just noticed that there were two old tombs near her house. I doubted the first one as it didn't look like from 18th century and were surrounded by other tombs. I called Pak Dipo to ensure the location. He said that the tomb stood alone in the middle of a ricefield. So it was the second one I guessed. It took about about five minutes to reach the place by walking through ricefields. 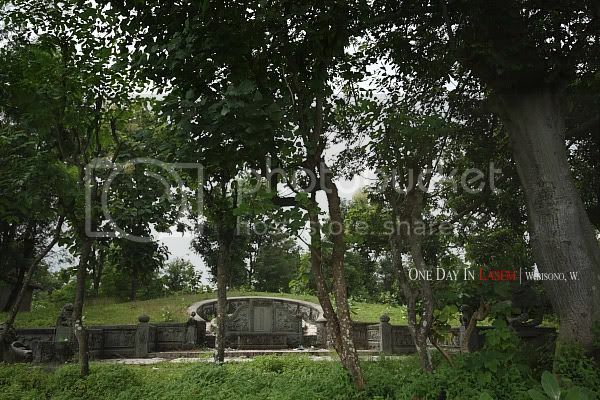 Finally, we arrived at the tomb which was surrounded by tall trees. It was a bit dramatic when the wind suddenly blew, swinging the tall trees as if to welcome us. We decided to take a break for lunch and pray at the Grand Mosque before heading to old Chinese temples. First, we came to Cu An Kiong at Dasun. This was my second visit. There were some TV crews from Metro TV who seemed to be covering a story for their program related to Chinese new year. Not as we expected, there was only one person coming to the temple for praying. Next, we stopped at Gie Yong Bio as my friends would like to see the altar of Raden Pandji Margono. 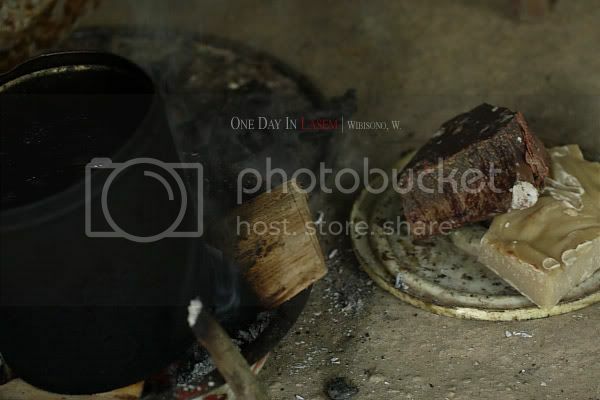 I have described about this man in my first posting about Lasem in this blog. We faced similar condition there. No one came to the temple for praying. At 500 PM, we left the temple and headed back to Semarang. Along the way from Lasem to Rembang, I suddenly wondered what would possibly break the curse of Han Siong Kong. Mmm ... may be Han Siong tried to tell me through the wind that suddenly blew at his grave. Well, too bad, I didn't hear his whisper. Itu foto di bawah beringin, menggangu bgt deh orang yg pake jaket orange. Kok gak disuruh minggir sih? Iya tuh! Tadinya mau ta' suruh minggir... Eh tiba2 si bapak dengan pikulan lewat, jadi langsung jepret! Masih penasaran dengan semacam;kain/karpet/taplak meja, yang ada rumbai2nya, yang ditaruh di genteng klenteng..., artistik bgt gitu mas. Mas Ari, kalo ada waktu, coba susuri pesisir utara Jawa (kawasan niaga zaman dulu)... banyak banget yang bisa kita eksplor di sana. Terima kasih sudah mampir. Saya mau minta tolong kepada bpk dan rekan yang lain. Atas bantuannya dihaturkan banyak terima kasih. It's an honor to be visited by someone from Indohoy. Thanks for coming to my blog. I'm glad to hear that. Have a nice trip! Terima kasih.... Udah pernah ke Lasem? 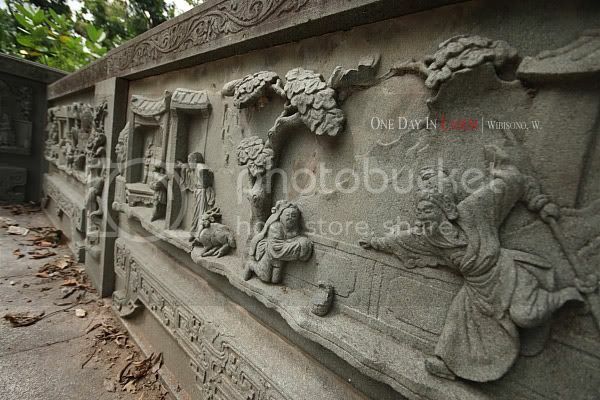 It is good to read about the Tomb of Han Siong Kong. As far as I know, the curse was meant for 12 generations. Is it a reallity? ?